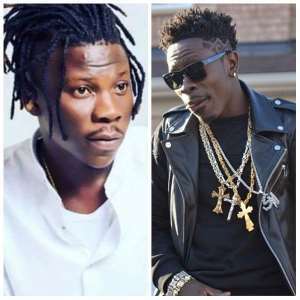 It was a big night for people at Kumasi as Dancehall artistes, Shatta Wale and Stonebwoy thrilled the audience with yet another amazing performance at the Vodafone Ghana Music Awards nominee’s jam which took place at the Kumasi City Mall in the Asante Region on April, 6. Stonebwoy put up an epic performance while Shatta Wale kicked it up a notch higher with a superb performance. It was very interesting to see these two rivals put their differences aside to wow their fans. For the Bhim CEO, as he performed many of his hit songs including Hero and the trending 'kpo keke'. Shatter Wale promised his performance would be amazing and he did not disappoint. The 'Gringo' hit maker hit the stage at the nominees jam and performed some of his hit songs, Hosanna, kakai, Roll it, Dancehall king among others. With the audience cheering on either side of him, Shatta Wale reminded fans what a true musician he really is and as usual, his performance was energetic.